Marriott International, Inc. (NASDAQ: MAR) and Starwood Hotels & Resorts Worldwide, Inc. (NYSE: HOT) announced today that the companies have signed an amendment to their definitive merger agreement that creates the world’s largest hotel company. Under the terms of the amended merger agreement, Starwood shareholders will receive $21.00 in cash and 0.80 shares of Marriott International, Inc. Class A common stock for each share of Starwood Hotels & Resorts Worldwide, Inc. common stock. Excluding its timeshare business, the transaction values Starwood at approximately $13.6 billion ($79.53 per share), consisting of $10.0 billion of Marriott International stock, based on the closing price of $73.16 on March 18, 2016, and $3.6 billion of cash, based on approximately 170 million outstanding Starwood shares. Starwood shareholders will own approximately 34 percent of the combined company’s common stock after completion of the merger, based on current shares outstanding. 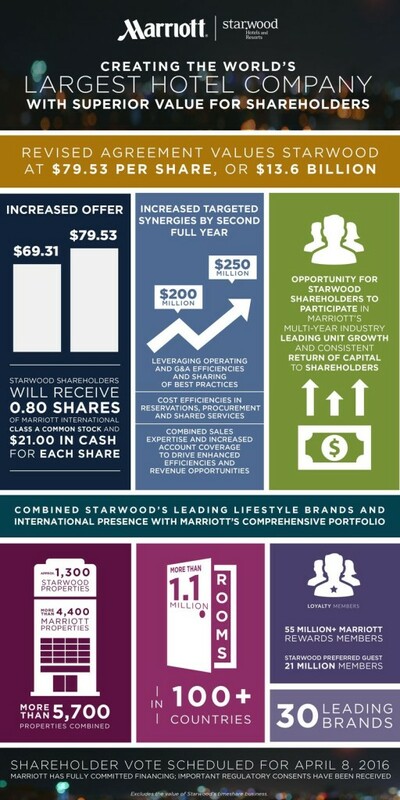 In addition, Starwood stockholders are expected to receive separate consideration in the form of Interval Leisure Group (NASDAQ: IILG) (“ILG”) common stock from the spin-off of the Starwood timeshare business and subsequent merger with ILG, currently valued at $5.83 per Starwood share, based on ILG’s share price as of market close on March 18, 2016 (the “ILG transaction”). Both companies continue to expect the closing of this transaction will occur well before the planned date of the Marriott-Starwood merger closing. The amended agreement and the ILG transaction have a combined current value of $85.36 per share of Starwood common stock. This revised agreement offers superior value for Starwood’s shareholders, the ability to close quickly, and provides value creation potential that will allow both sets of shareholders to benefit from improved financial performance. Marriott and Starwood have already obtained important regulatory consents necessary to complete the transaction, including clearing pre-merger antitrust reviews in the United States and Canada. Arne Sorenson, President and Chief Executive Officer of Marriott International, said: “After five months of extensive due diligence and joint integration planning with Starwood, including a careful analysis of the brand architecture and future development prospects, we are even more excited about the power of the combined companies and the upside growth opportunities. We are also more confident of achieving our updated target of $250 million of cost synergies. With a higher cash component in the purchase price, we have improved the transaction’s financial structure as well. “We expect to accelerate the growth of Starwood’s brands, leveraging Marriott’s worldwide hotel development organization and owner and franchisee relationships. On the top line, combined sales expertise and increased account coverage should drive additional customer loyalty and increase revenue. Hotel level cost savings should benefit owners and franchisees, including better efficiencies in reservations, procurement and shared services. The company will have a broader global footprint and the most powerful frequent traveler programs in the industry, strengthening Marriott’s ability to serve guests wherever they travel. Bruce Duncan, Chairman of the Board of Directors of Starwood Hotels & Resorts Worldwide, said, “We are pleased that Marriott has recognized the value that Starwood brings to this merger and enhanced the consideration being paid to Starwood shareholders. We continue to be excited about the combination of Starwood and Marriott, which will create the world’s largest hotel company with an unparalleled platform for global growth in the upscale segment. We are also pleased with the progress the two companies have made toward closing. The transaction is subject to Marriott International and Starwood Hotels & Resorts Worldwide stockholder approvals, completion of Starwood’s planned disposition of its timeshare business, obtaining remaining regulatory approvals and the satisfaction of other customary closing conditions. Marriott and Starwood have each agreed to convene its respective stockholder meeting to consider the transactions contemplated by the amended merger agreement on March 28, 2016 and to immediately adjourn such meeting until April 8, 2016. Assuming receipt of the necessary approvals, the parties continue to expect the transaction to close in mid-2016. The break-up fee payable by Starwood in certain circumstances increased to $450 million from $400 million. In circumstances in which the termination fee is payable , Starwood would also be required to reimburse Marriott for up to $18 million of actual costs incurred by Marriott in connection with the financing of the transaction. As announced on March 18, 2016, Starwood’s Board previously determined that the binding and fully financed proposal from a consortium consisting of Anbang Insurance Group Co., Ltd., J.C. Flowers & Co. and Primavera Capital Limited (the “Consortium”) to acquire all of the outstanding shares of common stock of Starwood for $78.00 per share in cash constituted a “Superior Proposal,” as defined in the merger agreement. The Consortium’s proposal, together with the ILG transaction, have a combined current value of $83.83 per Starwood share. In connection with the amended merger agreement, Starwood’s Board of Directors has determined that the Consortium’s proposal no longer constitutes a “Superior Proposal”, and therefore under the merger agreement Starwood is no longer permitted to engage in discussions or negotiations with, or provide confidential information to, the Consortium. Starwood’s Board unanimously recommends the amended merger agreement with Marriott to Starwood’s stockholders. Marriott International will conduct a conference call for the investment community on Monday, March 21, 2016 at 8:00 a.m. ET. The call will be webcast simultaneously at Marriott’s investor relations website www.marriott.com/investor. The webcast can also be directly accessed through the following link:http://cache.merchantcantos.com/webcast/webcaster/4000/7464/7467/59394/Lobby/default.htm. The telephone dial-in number for the conference call is (866) 966-5335 and for participants outside the U.S., +1 (646) 843-4608. No passcode is required for the call. A telephone replay of the conference call will be available for seven days. To access the replay, call (866) 583-1035. The conference ID for the recording is 7411783#. A slide deck is also available on Marriott’s investor relations websitewww.marriott.com/investor.